Wenatex collected money for heart surgery, which was desperately needed by Ayah, the four-year old girl from Iraq. At the Wenatex Racing Day in Riem, generous donations were made for the Cardiac Centre in Munich. The money that was collected helped to allow little Ayah to have heart surgery. Fate didn’t deal little Ayah from Iraq a very good hand. She was born with a hole in cardiac septum, a heart defect that should really be subject to surgery during the first year of life. However, the family didn’t have enough money for the expensive operation and the government turned down the request for financial aid toward the surgery. 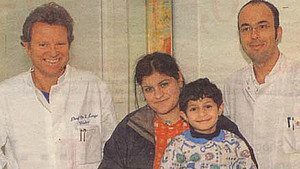 The result of this was that Ayah suffered from continuous infections and laboured breathing, the girl’s condition became increasingly worse.When Wenatex found out about little Ayah’s fate, through the Cardiac Centre in Munich, it was quite clear: Help must be provided quickly. Therefore, Wenatex organised a racing day at the horse race track in Munich-Riem in order to raise money for Ayah’s heart surgery. The race was won: Thanks to Wenatex, Ayah was successfully operated on at the Cardiac Centre Munich and now she can laugh again, at last.